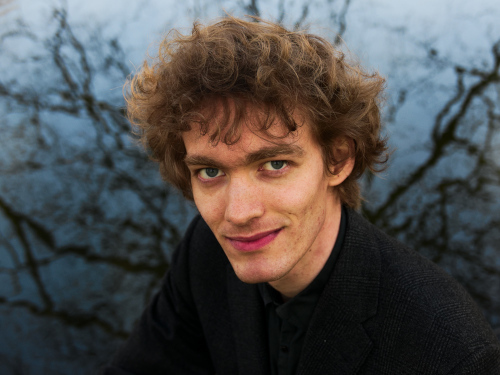 The young Norwegian conductor Kai Grinde Myrann (b. 1987) has in a very short time established himself as one of his generation's most talented conductors. He has already conducted all of the Norwegian professional symphony orchestras, and been re-engaged in all of them. He has also conducted some Danish orchestras, some Norwegian military bands and several smaller ensembles and choirs. After graduation from the Norwegian Academy of Music with a Master's Degree in conducting in 2013, he immediately won the positions as Assistant Conductor both in the Stavanger Symphony Orchestra and in the Bergen Philharmonic Orchestra; both of which were extended to their maximum duration of two years. From 2015, Myrann held a scholarship in conducting at the Arctic University in Trømsø. Myrann is the artistic director of Aksiom, an nine-man strong ensemble for new music that he co-founded in 2010, and he has lead the ensemble into becoming a sought-after ensemble in the Nordic contemporary music scene. He is also the conductor of Ensemble Temporum, an ensemble founded in 2016 specializing in classic masterpieces of the contemporary music repertoare. Holding a Bachelor's Degree in composition from the Norwegian Academy of Music and Hochschule für Musik “Hanns Eisler” in Berlin, and with his conducting experience, Myrann is a trusted interpreter of contemporary music. Myrann's discography, currently counting Aksiom's well-resepted, eponymeously named debut CD, is soon to be extended with several releases of contemporary music with the Norwegian Radio Orchestra and Trondheim Sinfonietta. In 2014, Myrann finished the Princess Astrid International Music Competition with a place in the semi-final, being the best among the Norwegian cometitors. 2011–2014, Myrann was the Chairman of the Norwegian board of Ung Nordisk Musik, an organisation devoted to arranging festivals with music by young Nordic composers. In 2013 he was in charge of the festival held in Oslo, with 35 participating composers. Kai Grinde Myrann is since 2013 represented by On Stage Management.